Hey friends! Today I want to introduce you to Susan – my good friend and assistant. 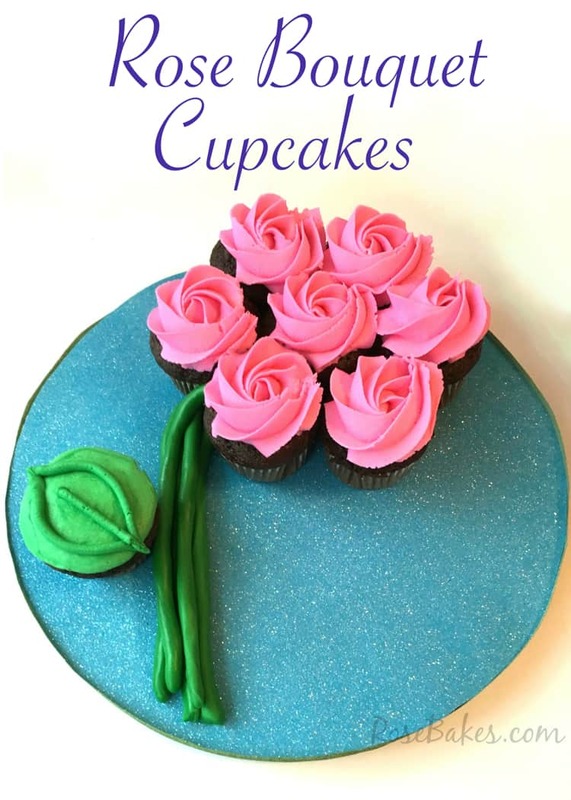 She’s going to start sharing some of her very own tutorials and recipes here on Rose Bakes from time to time… starting today with How to Make a Flower Cupcake Cake! Mother’s Day will be here before you know it and I have a great idea for a gift for her! 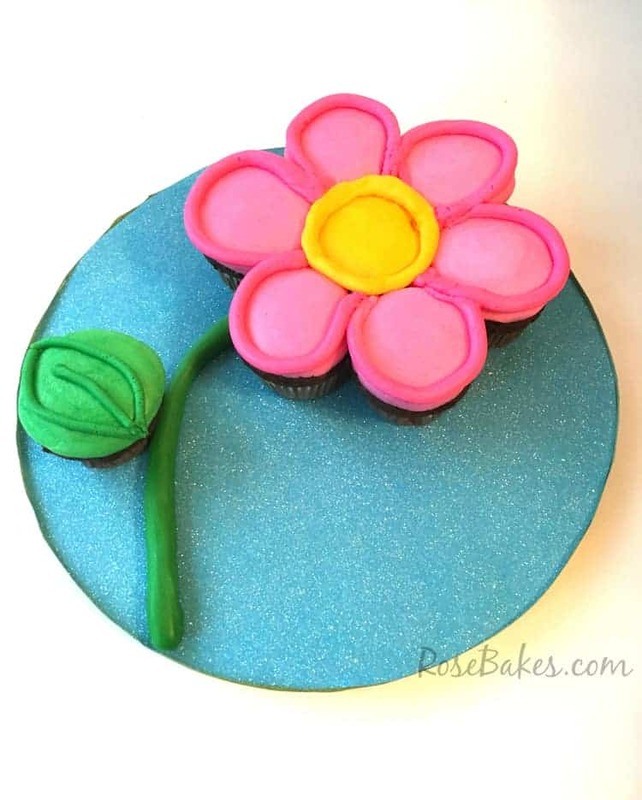 It involves flowers, cupcakes, and something you made – all 3 are sure winners, right!? 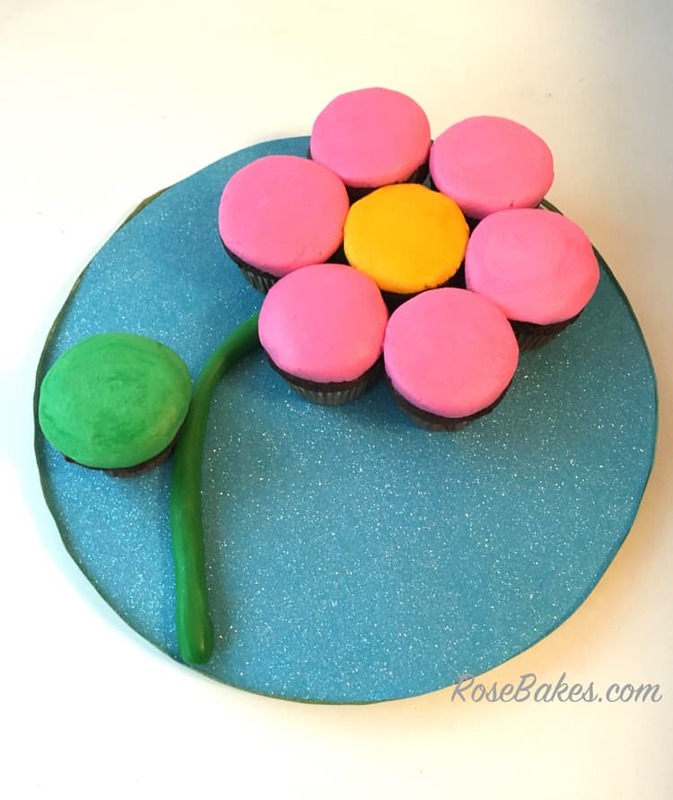 I’ll show you How to Make a Flower Cupcake Cake and a bonus variation Rose Cupcake Bouquet. 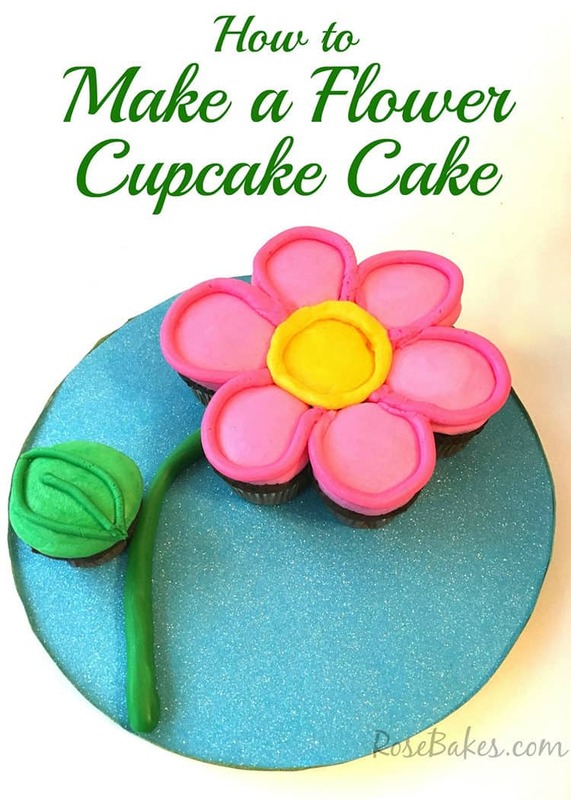 Start off by decorating your cake board how ever you’d like to display your flower. I covered mine with glitter paper and ribbon. 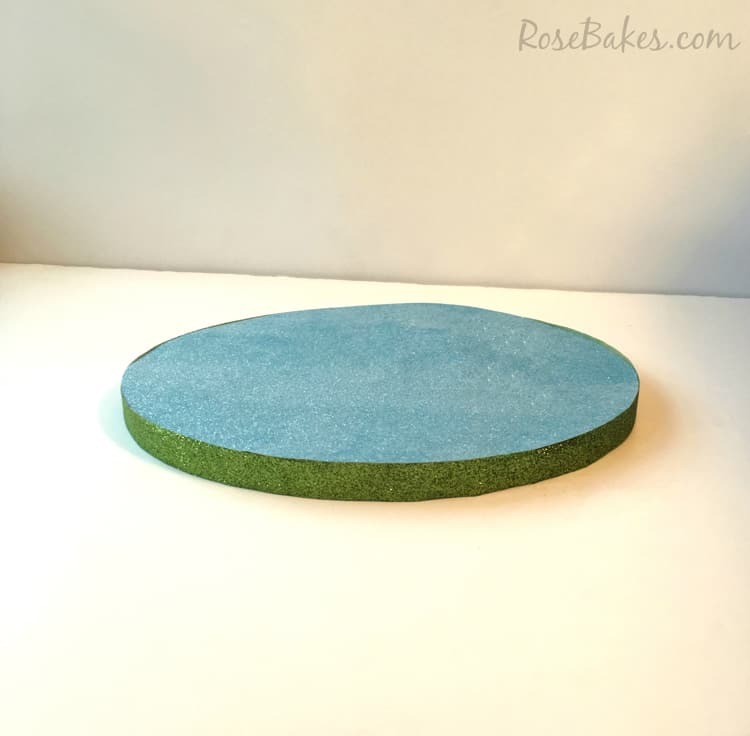 Rose also has this great tutorial on how to dress up a cake board. 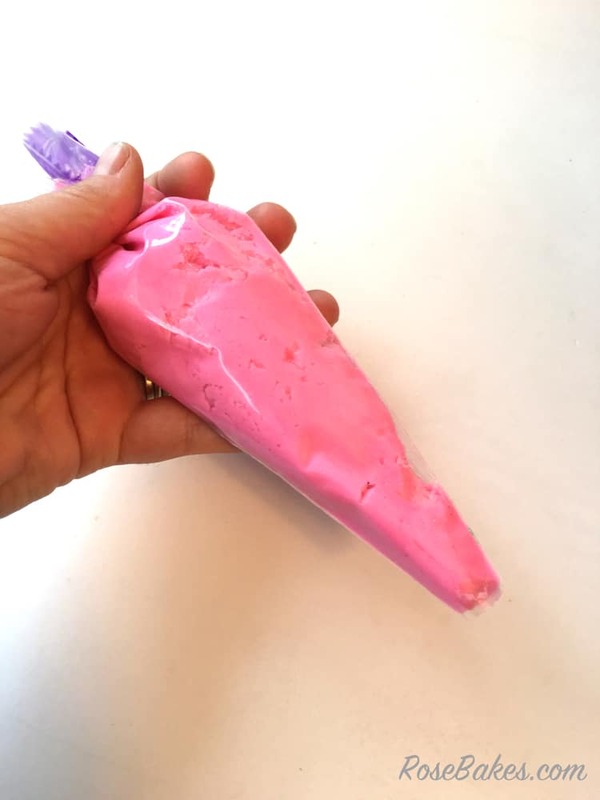 Fill a piping bag with the tip cut off or fitted with a large round tip. You will need pink (or color of your choice) for the petals, yellow for the center of the flower, and green for the leaf. Pipe the icing onto the cupcake to cover the top out to the edge. 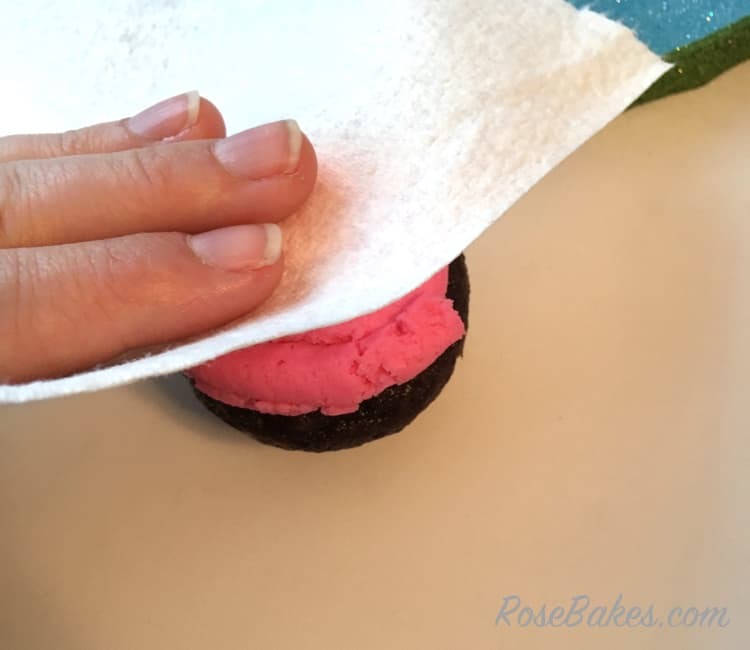 Use the smooth side of a Viva paper towel to smooth the icing by gently applying pressure. 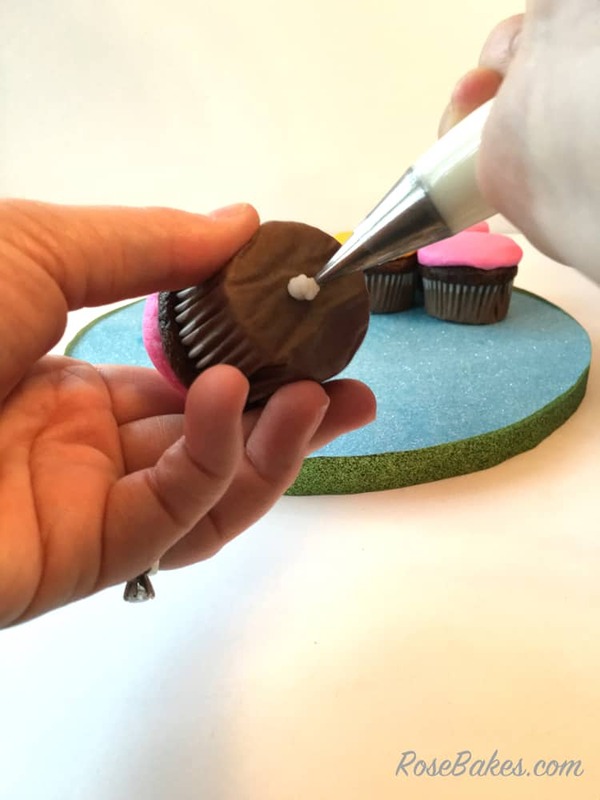 To attach the cupcakes to the board, apply a small bit of icing to the bottom of the cupcake. Arrange six pink petals around one yellow center. Roll a rope of green fondant to make the stem and arrange on the board how you like. Add the green cupcake for the leaf next to the stem. 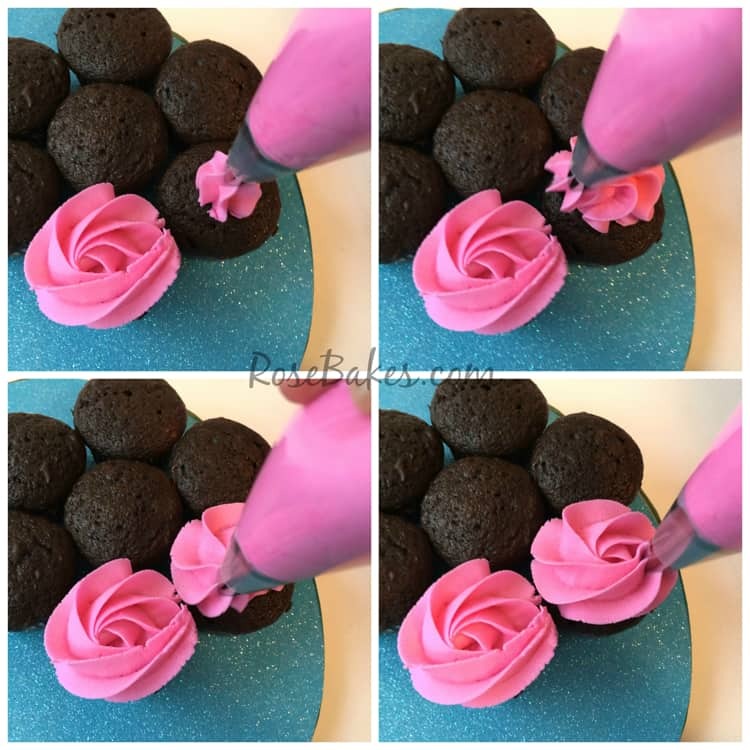 Fill a piping bag fitted with a Wilton 10 round tip with icing a shade or two darker than the petal color. Pipe an outline around each cupcake. Then pipe an outline around the yellow center. 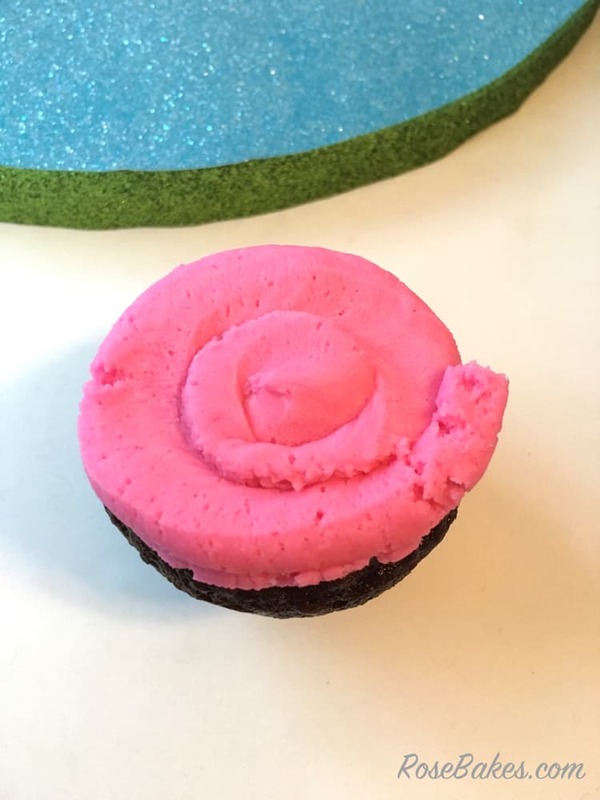 I used a Wilton 7 round tip to pipe a leaf onto the green cupcake. All done! I also made a variation to look like a bouquet of roses for a quick and easy presentation. 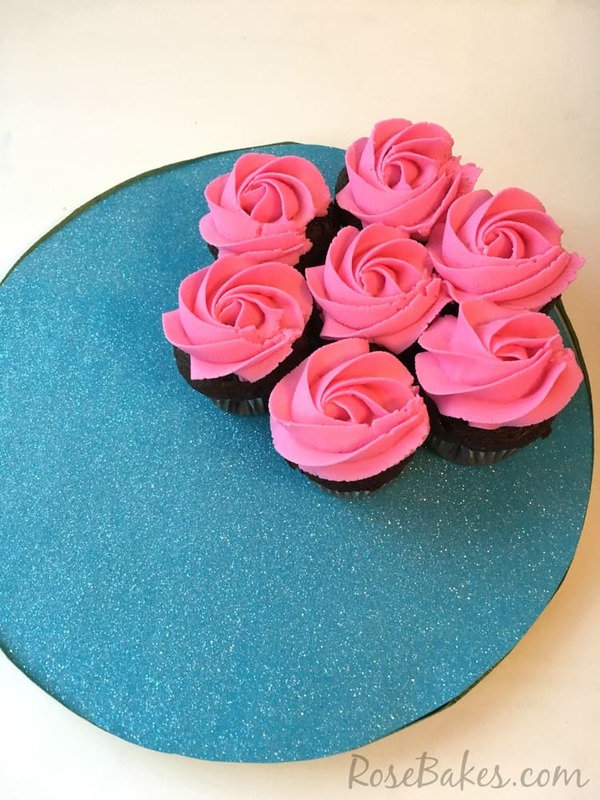 I placed cupcakes in the same configuration as the above flower so there would be 7 roses. 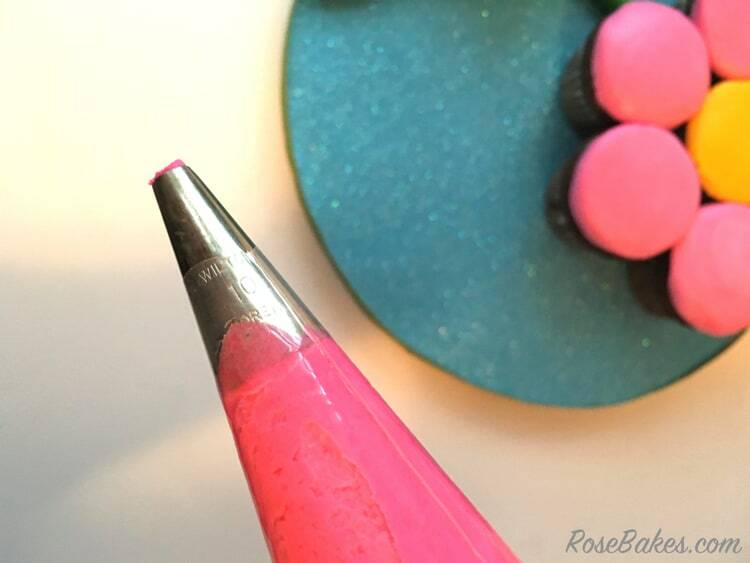 Pipe rosettes on each cupcake by using a Wilton 1M star tip. Start in the middle and in one continuous motion, swirl the icing around the center. Roll several thin ropes of green fondant to make the stems to the roses and arrange onto the board. Add a green cupcake with a leaf piped on next to the stems, and you’re all done! Hope you’ll try one or both of these cupcake cakes – they’re sure to be a hit! Susan Bolivar is a contributor to Rose Bakes, virtual assistant, and the cake decorator behind I Bake - You Enjoy. She lives with her husband and 2 children in South Mississippi. Her work has been featured in Cake Central Magazine and Cake Geek Magazine. Super cute for a girls party! I love it! Shared. Thank you for sharing on Merry Monday! Hope to see ya next week! Thanks, Kim! They’re fun to make!